Pascal Donohue is Ireland’s Minister for Finance, having previously served as Minister of Public Expenditure and Reform. He was elected to the Seanad (Irish Senate) in 2007 and became an elected member of parliament for the Dublin Central constituency in 2011. A graduate of Trinity College Dublin in Politics and Economics, Donohue was chosen to work for Procter & Gamble in the UK as part of their fast-track graduate training programme. He spent six years in London before becoming director of sales and marketing. 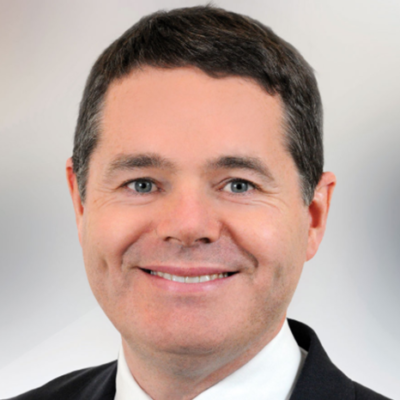 Returning to Ireland in 2004, Donohue took up a senior position with Diageo, before running for Dublin City Council where he served on a number of committees, including Chairperson of the Environment Strategic Policy Committee. He was formerly the Chair of Ireland’s Future in Europe Oireachtas Sub-Committee, as well as a member of the Public Accounts Committee. He has also served as the Vice-Chair of the European Affairs Committee and, as a Senator, he served as a member of the Joint Oireachtas Committee on Transport. Pascal Donohue currently lives with his wife and two children in Phibsborough in Dublin city.